The Platonic, Pythagorean, and Perfect Solids: Alliteration aside, Let’s imagine you are on the inside of a sphere and are asked to make a bunch of different three-dimensional forms using only straight lines that all touch the surface of the sphere. You could make all kinds, an infinite amount actually. But if every line had to be of equal length, and all the shapes made had to be the same, you could only make 5 different ‘perfect solids’ if you will. These perfect solids are an intrinsic quality of our geometric reality. There is esoteric knowledge hidden in the way Nature structures itself, the most obvious being that there are five of these forms that create reality. There can be only five. You can prove this to yourself conceptually. To make 3-D forms, first we need to start out with 2-D shapes. Two points on a piece of paper can’t make a shape, but three can, so the first shape is the triangle, the second is the square, and the third is the pentagon. The fourth shape is the hexagon but if you try to put a bunch of hexagons together to make a 3-D form it just doesn’t work. They leave gaps in-between. 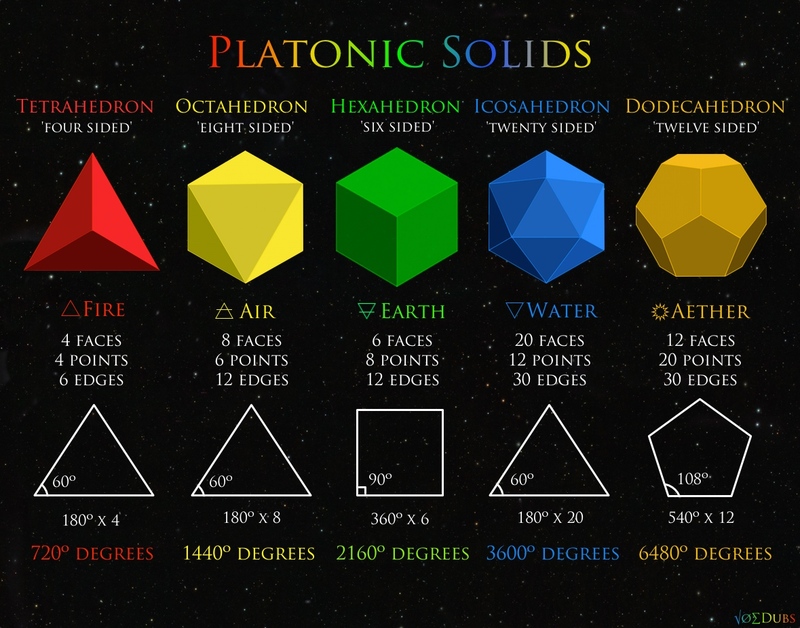 Only triangles, squares, and pentagons can be combined three dimensionally to create ‘Platonic solids’. Let’s just call them ‘perfect solids’ because it’s debatable who first discovered them. We can connect three equilateral triangles together to make a point. One more is required to fill in the other side for a total of four triangles. This is called the tetra-hedron, the first perfect solid. 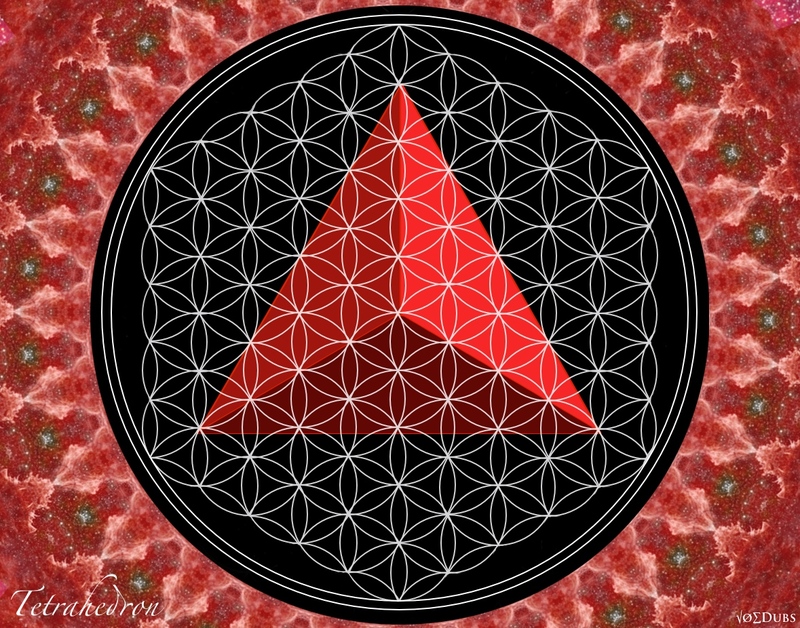 Tetra means four, and ‘hedron’ means sided. Plato associated this solid with Fire because its pointy ends mimic the stabbing sensation of a flame. Spicy food burns your mouth because of its tetrahedral composition at its molecular level. At this point you’re sticking out your tongue trying to get more air, which leads us to our next solid, the Octahedron. Four triangles fit together to make a pyramid. Picture the great one at the Giza plateau. 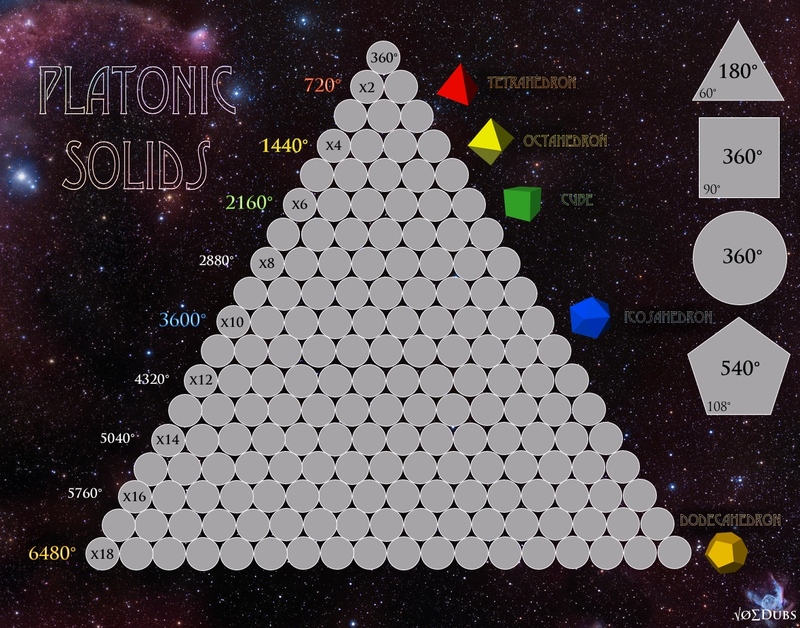 However a pyramid is not a Platonic solid, since there’s a different shape at its base, a square. 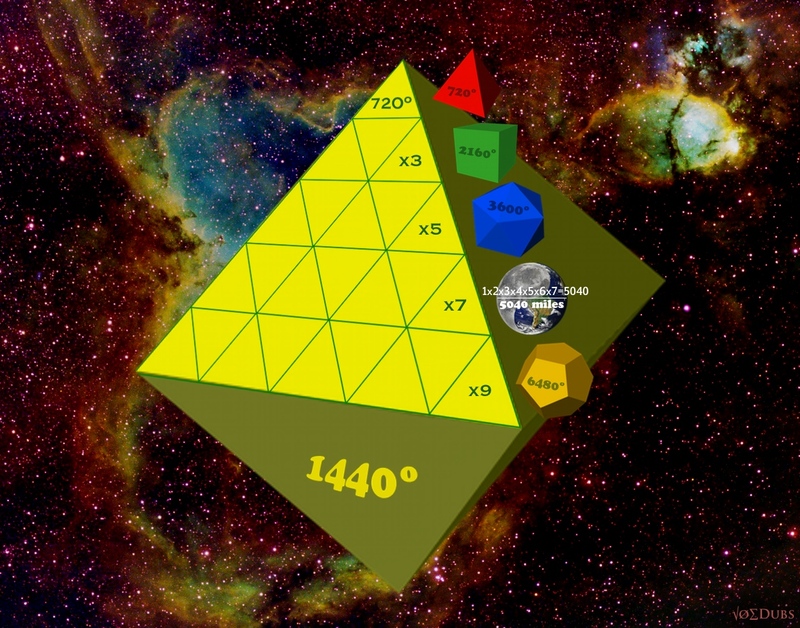 If we took two great pyramids and put them together at their square base we would create the second most complex perfect solid; the octahedron, which symbolizes Air according the Plato and many other sources. ‘Octa’ means eight. But, don’t let Octo-ber fool you being the tenth month of the year; Pope Gregory messed up the calendar 1500 years ago (I think..) The first month is actually March, which makes a lot more sense. In this regard, Sept-ember, Oct-ober, Nov-ember, and Dec-ember all fall on their respective etymologically numeric moon-ths. Sept means 7, Octo means 8, Nov means 9, and Dec means 10. Maybe we should correct Pope Greg’s egregious mistake and fix the calendar. Now, back to geometry. If we took five equilateral triangles and put them together at one point this would begin the construction of an icosahedron. Icosa, meaning twenty. We would have to add 16 more triangles to complete this solid. This was associated with Water perhaps due to its ball-like shape, similar to a bead of water. The icosahedron is the least stagnant and most spherical of the five solids. If we took six triangles and put them together we would see that they form a flat surface, so this is no good. We can’t make any more of these perfect solids with triangles alone. Logically we have to go on to the next shape to make more perfect solids. Would you like to join us in this geometric adventure!? Be there, or be…… square. The cube is the only perfect solid made of squares. Three squares join together to make a point. If we put four squares together at one point, we’d just get another larger square which is not three-dimensional. Square has etymological roots in ‘quad’, which means four. A cube is also called a hexa-hedron. Hexa means six. Hedron means sided. So we have a six-sided perfect solid made of squares. 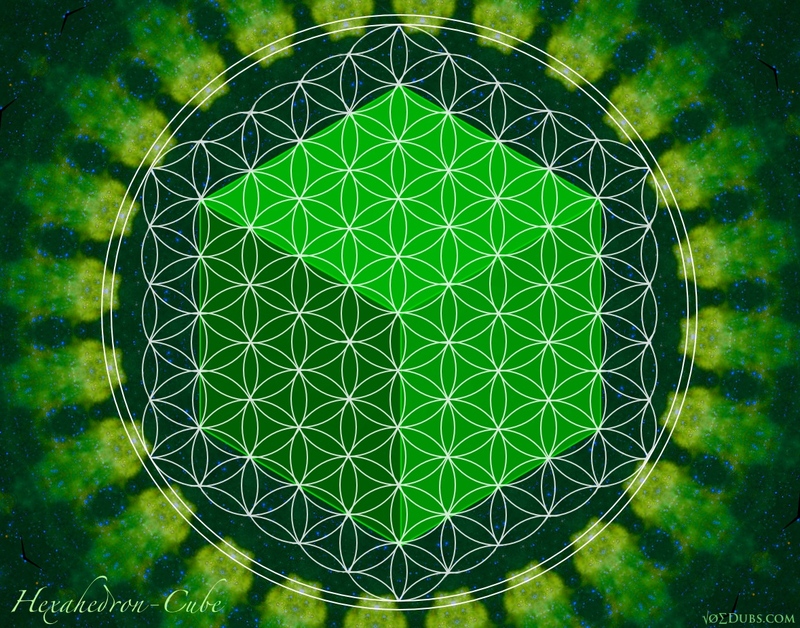 Plato associated the cube and the square with Earth. The sphere or circle would symbolize Heaven or the “One Mind” if you will. If there is a Creator and He or She started with a sphere, the cube might be the first choice to use since it models the most 3-D space out of any of the other perfect solids. The dodecahedron is the last of the perfect solids and is composed of pentagons. Dodecahedron means twelve sided. 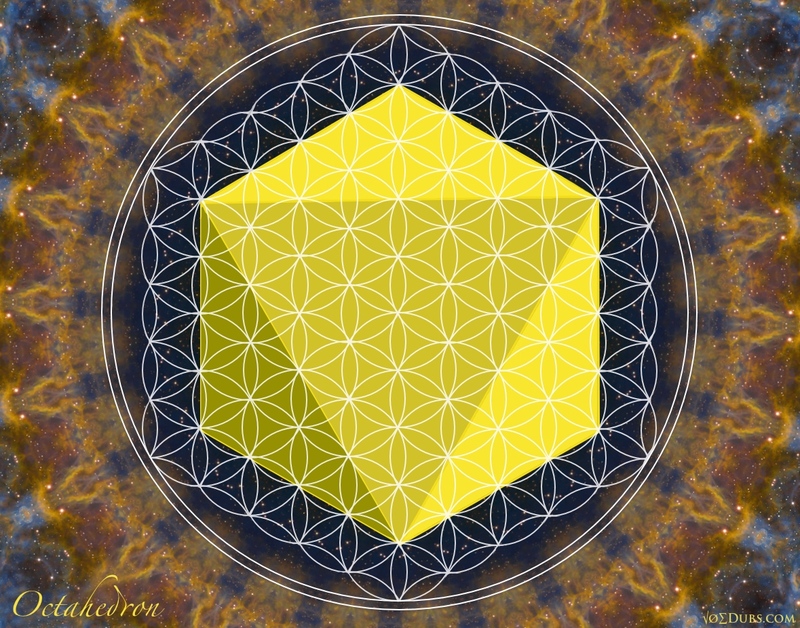 The twelve sides consist of pentagons which reflect the total number of perfect solids and encode the golden number which is inherent in all life. Three penta-gons (five-sided shapes) fit together at one point. Nine are added to complete the construction of the most mysterious and ineffable of all the perfect solids. There are 360° degrees in a circle, 180° degrees in a triangle, 360° degrees in a square, and 540° degrees in a pentagon. With this information we can figure out the total angles in each of the solids. This will prove to be useful when we are looking at distances in the cosmos, measured in ancient imperial units, like miles, furlongs, and feet. The 3-D geometry of the universe is based on these perfect solids. This knowledge was not invented, but discovered. It’s inherent in all things. 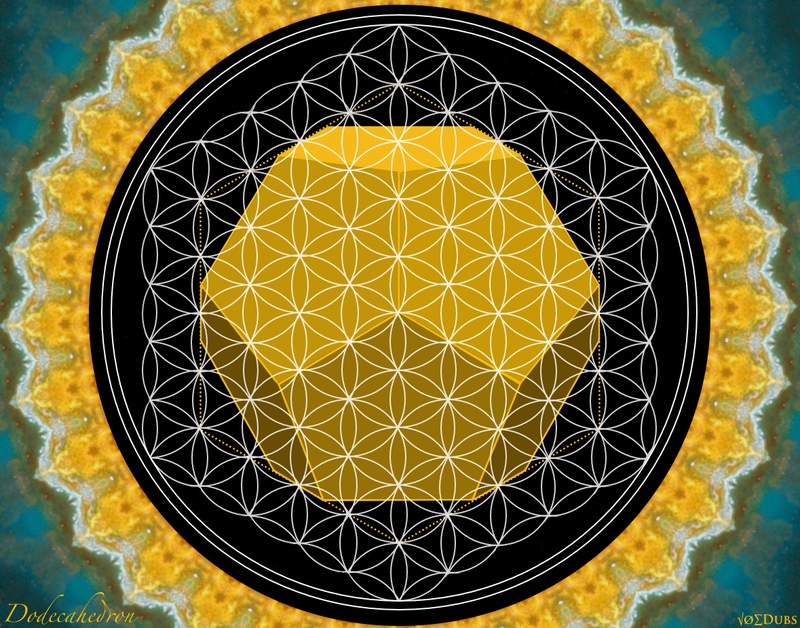 This geometry is the armature or structure of the matrix that makes up our reality. 3,4, and 5 are the first numbers that combine to form the first so called ‘Pythagorean Triple’, which obeys the rule ‘A squared plus B squared equals C squared’ (See…high school geometry did come in handy after all). The physical sizes of Earth and Moonencode the 3-4-5 triangle, which itself also encodes Phi, and therefore encodes life. Earth and Moon are not alone, however. We must include Sun in the trinity. The spelling of their names, in English, is a clue to unraveling the Pythagorean Triple Mystery. S u n(3), M o o n(4), E a r t h(5). 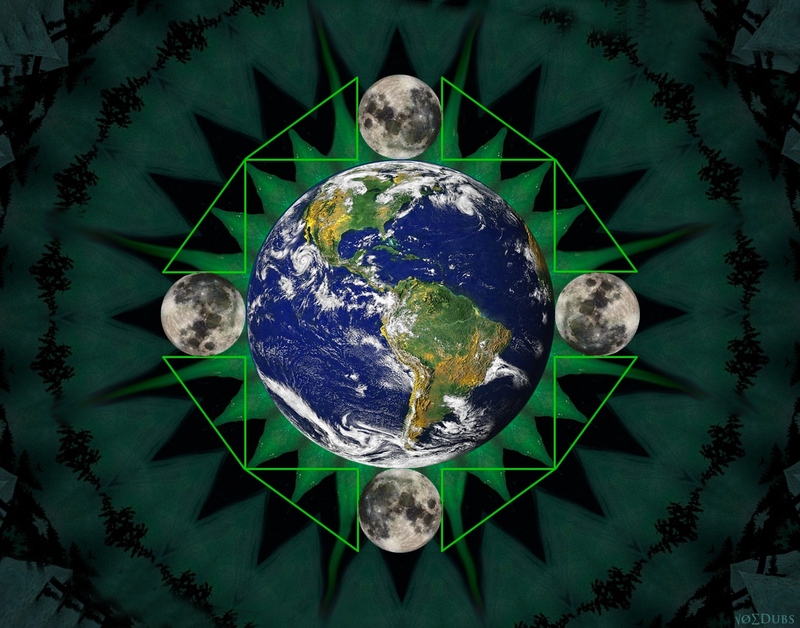 If the Moon was pulled next to Earth the dimensions would create two 3-4-5 triangles on either side. The squares around Earth and Moon are 11 and 3, respectively. 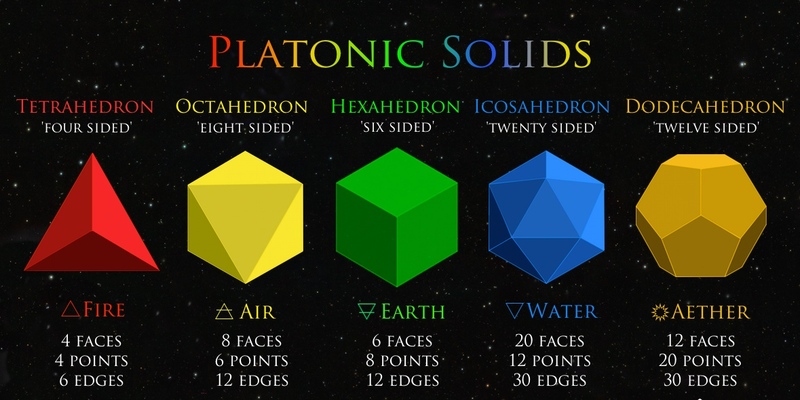 Like our five senses there are five Platonic solids, each of which is made up of shapes that have 3,4, or 5 sides. The tetrahedron is made up of 4 triangles(3-sided), the octahedron, 8 triangles. And the icosahedron has 20 triangles. 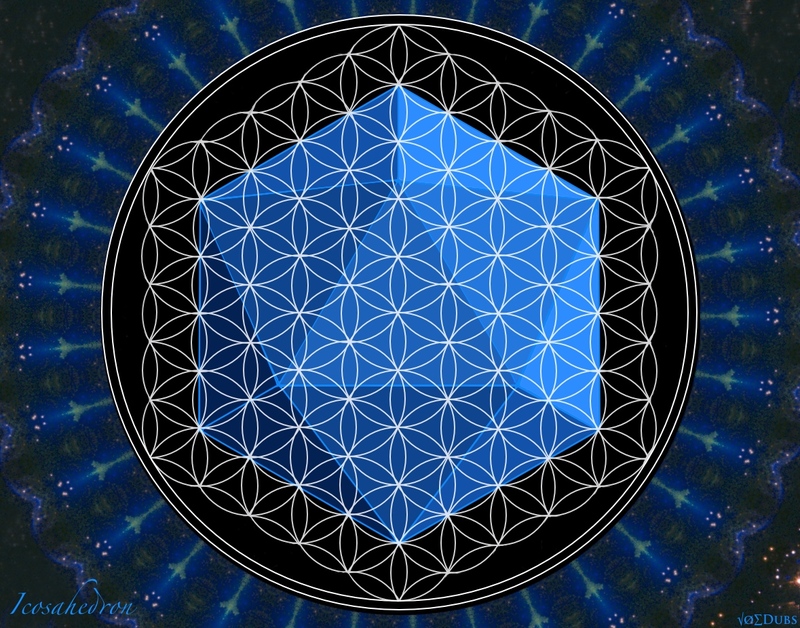 The cube is composed of 6 squares(4-sided) and the dodecahedron is made of 12 pentagons(5-sided). 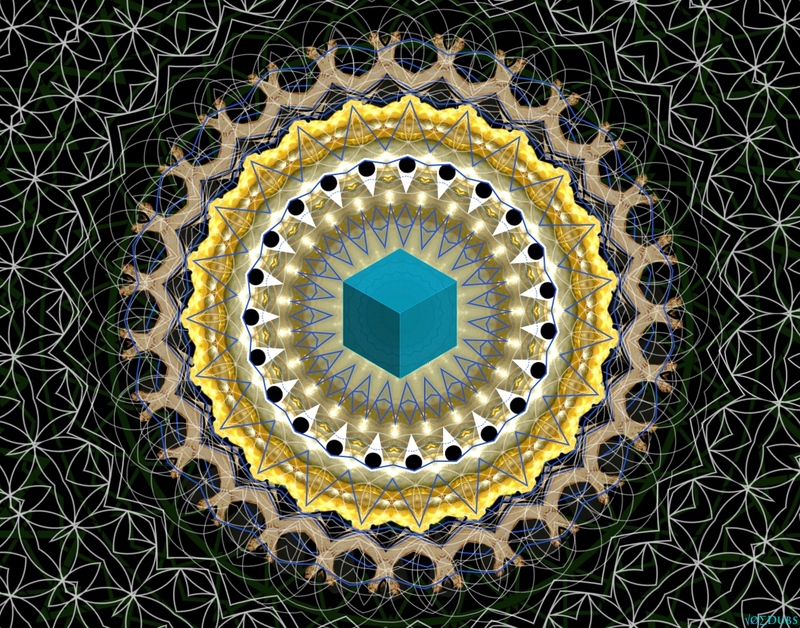 Three-Four-Phive is reflected in the way nature structures itself, based upon the simplest 3-D geometries in our reality. Can you see the three-four-fiveness? Both in the shapes and how the shapes meet? 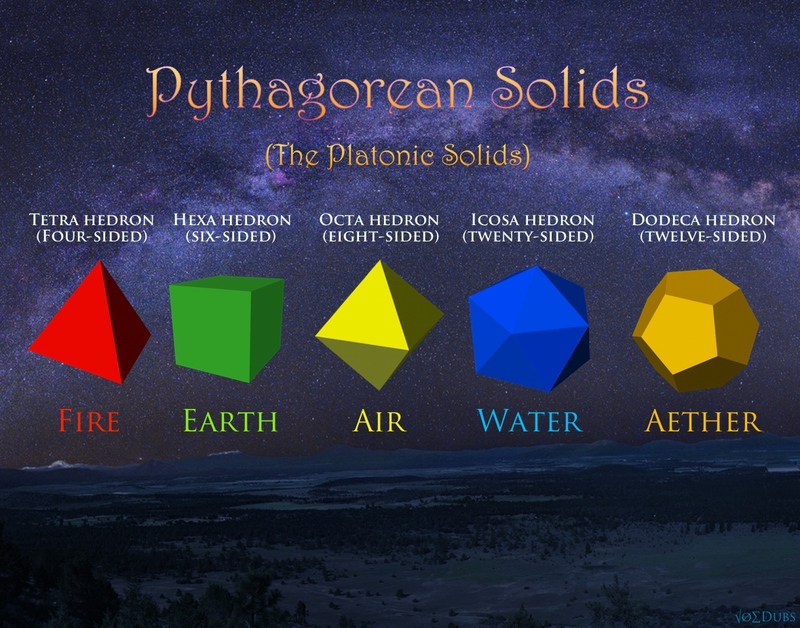 Perhaps we should call them Pythagorean solids since they encode his famous 3-4-5 triangle? In addition the Platonic solids also encode 3-4-5 in the way the shapes fit together. The tetrahedron, cube, and dodecahedron have three shapes at their corners. The octahedron, four. And the icosahedron has five shapes coming together at every point. Again, the Three-Four-Phiveness, in the way Nature structures itself. The angles of the perfect solids display a pattern that is broken with 5040, which is the mean radii of both Earth and Moon in miles. 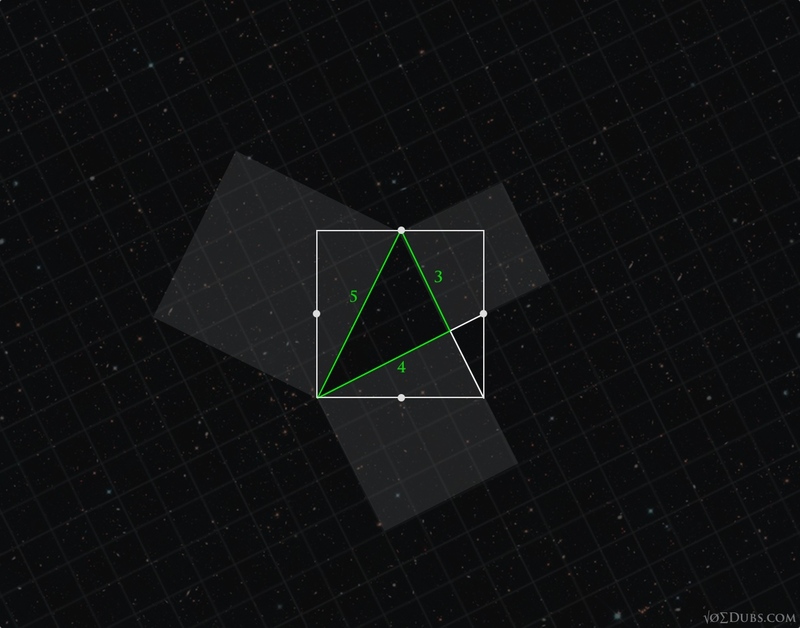 The angles of the octahedron has no place on this triangular grid.